COTIC : news : ROCKET DELIVERY CONFIRMED! The exciting news this week is that we have delivery confirmation on the main batch of Rockets. It will be with us on 18th November, so order now or at the demo you'll have your Rocket on Friday 20th November GUARANTEED! We also have all our XT M8000 11spd drivetrains in stock, so we can do bikes too. Order yours today! Our first demo with the new Rocket275 went off brilliantly on Saturday. We'll admit we were not looking forward to it as the rain hammered down early in the morning, but it was actually really warm. Despite the odd shower it was never uncomfortable, and despite packing almost all the cycling clothing we owned, we only needed the first set we climbed into. Most of the time it was too warm for a jacket even when the rain was falling. By lunch time it was blue skies and sunshine and we were treated to gorgeous views of Chatsworth down the valley. We were busy all day, and we had a great time talking to people about the bikes, introducing them to the somewhat 'exciting' conditions on our locals trails, and getting some brilliant feedback on the Rocket. To a person everyone who tried it loved it, with most commenting how well it climbed, and also giving some very positive comparisons to other bikes they'd demo'd recently. Great to hear!! With the nature of the bike and the geometry numbers, you can see it will be great riding down hills, but right from the start with the Rocket26 people have been pleasantly surprised by the bikes' climbing abilities. This was of particular relief to a few of the demo riders who were experiencing 1x drivetrains for the first time, although our 30/42 spec bottom gear on the XT bikes was purposefully chosen to be easy on the legs on big days in the hills. On the way back down our test track, it was rocky, rooty, slippery and covered in leaves. You needed a confidence inspiring bike and everyone had a ball on their Rocket. Again, a lot of nice comments about the bikes lightness of touch, not feeling heavy and feeling fun and easy to pop around. We're doing it all again this coming Saturday at our base in Calver in the Peak District. 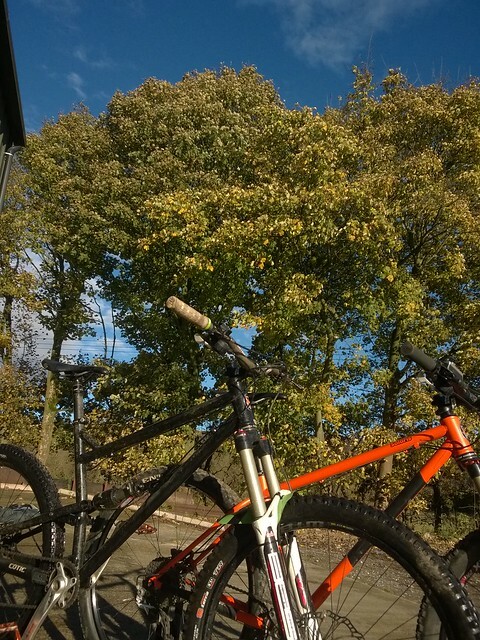 We still have rides available on both the medium and the large bikes, so email demo@cotic.co.uk or 07970 853531 to book onto a ride. Don't worry about the weather, the forecast looked like the apocalypse and it turned out lovely. Come over and have a go: It will be great! !